This weekend was the last event of the year for me, the Great North Walk 100 mile (nearly 108miles in reality). This is my third attempt at this ultramarathon, with a DNF in 2009 and a successful finish last year. On both occasions it was particularly warm with temps up in the mid 30’s, and with this year’s forecast being cooler around 27c I was quite optimistic, even though my preparation hadn't been ideal. I was confident with what I had learnt in previous years and from my experiences running the Nullarbor a couple of months back that I’d be improving on last year’s time significantly. That said I was still very cautious of this course, renown as the toughest trail race in Australia, a title that it has justified with an average 50% attrition rate every year. To enter this race was a special treat for me as it was my 40th Birthday on the night before, but given what I had ahead of me, the celebrations were somewhat subdued. I did manage to carb load on a beautiful cake that my great crew, Dean Cox and Jaci Richards, had organised, and whilst I was enjoying good company the challenge that lay ahead of me was never far from the front of my mind. So with a 6am start, and an hour’s drive I made sure to get to bed early. I don’t know why as I didn’t sleep much, the mind was just racing. We got to the start at Teralba and it was great to see so many familiar faces, all bottled with excitement and nervous energy. 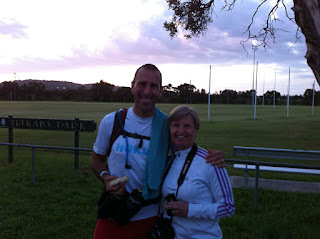 It was great to be in the company of some of the best trail runners in Australia. Dave Byrnes gave his race briefing with the warnings about the heat and wildlife, and this year a new feature of running beneath helicopters carrying logs a few metres above your head on the last section as there was some heli-logging happening. An entirely new and exciting hazard to deal with on the trail! Having gone out far too fast in previous years I am far more reserved this time, after all there is a hell of a long way to go at this stage. The field thins out after about 10kms and we get onto the trails proper. At this point I find myself advancing through the field steadily, running very much to my HR, and I’m feeling very much in control of things. I’m chatting with fellow runners along the way (the main topic seemed to be about my HOKAs, as the curiosity in the trail community grows exponentially) and I’m keeping up with my fluid and nutrition strategy. I remember chatting with Kevin “Brick” Heaton about the conditions and although it was cooler, it was humid, and with thunder rumbling away in the distance, it did look as though it was going to decrease. As I’ve mentioned in previous posts humidity is far more of a killer than heat, as at least with a dry heat your sweat will evaporate and offer some cooling benefit. To top that there was no noticeable breeze. There are a number of aggressive climbs in this first section, which I approached with a strong walk. It’s been one of my strengths to be able to power walk up these hills, although it’s never easy and it was no exception on this occasion. I made the most of the flats and downhills, for gentle running and recovery. There is a technical section through the dense bush where the humidity was pretty oppressive, and in my mind was that the sooner I get through this the sooner I can rest and get some cool fluids on board, whilst at the same time tempering the enthusiasm to go too hard at it. At the first Checkpoint (28.6kms) I’m feeling pretty good, there is no tiredness in the legs, mentally I’m sharp, the HR is steady and I’ve drunk 4.5l of fluids. Dean and Jaci get me back on track within a few minutes and everything is going to plan. Fortunately the next section offers some respite from intense long hills, with gentle rolling fire trails. I catch up with a few other runners and leave them behind on the technical downhills to Congewai road. A 6km stretch of open track offering next to no shelter at the bottom of a valley where the heat just never seems to escape. This section had been a real challenge in previous years, so I was looking forward to embracing it with a view to overcoming it. I managed to run all of it which I felt pretty good about, but was starting to get a bit of a headache. I had still been drinking well so thought that it must be related to either the hat being too tight or related to the lack of sleep as I was yawning running along here too. 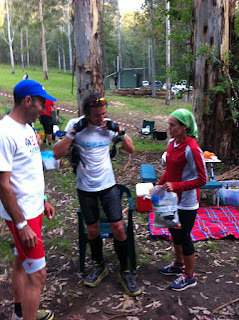 At the checkpoint there was a weight check, and I had lost over 3kgs in this first 53kms. This threw up a number of concerns. Firstly, this was not sustainable, without being about 15% by the finish! Secondly, if I’m already behind on my hydration, then how can I catch up and keep moving forward effectively. Thirdly, how can I control my enthusiasm, as I was feeling pretty good at this point? So I left CP2 with Nikolay, who had cruelly been keeping me about 50m behind him all the way up the road stretch. Back out along the road and then a right turn up into the bush to commence the climb up and out of the valley. My plan was to walk as much as possible and drink as much as possible at the same time, whilst still moving forward. The trouble is there are two severe climbs on this section, where even by walking you are working hard. Basically you just keep plodding on up out of the valley for what seems like an eternity. Then jog along the ridge for a while before descending into the Wattagan valley. At this point the thunder gets closer, and we get a brief wetting (which wasn’t a bad result as I had visions of a TV appearance for being struck by lightning as I was on the only open part of the course during the storm). This was a cruel shower for it was so light as to offer no cooling effect, but it made the trail slick and slippery, and given the heat already in the ground the water turned to steam getting the humidity up to what must have been close to 100%. By the start of the second climb out of the valley in these conditions I’m feeling a little dizzy and light headed, and the headache is coming in waves. At the top of this climb is an unmanned water stop, and I take advantage of a good drink, pouring a cupful over my head to cool off a little, and to sit on a log for a couple of minutes. I’m joined by Noel and Meredith (the subsequent female winner) and we trot off along the trails towards the next checkpoint, comfortable in the knowledge that it’s the end of the severe intense and long climbs for this section at least. From now on they’re shorter, but no easier. We run together, on and off until we get to about 4kms from the checkpoint. This is a densely wooded single track, and with huge number of fallen trees from recent storms this looked like a war zone! At this point I’m feeling nauseous, dizzy and the headache is still throbbing. I take the decision to walk all the way to the checkpoint, and drink about half a bottle of water in one go. I kept it down, but couldn’t face drinking anymore for the rest of the leg. I was lifted by seeing so many other running friends on this out and back section, Spud, Chris, Ian and then Meredith heading back out – she obviously meant business with a very quick turnaround at the checkpoint. I finally get into the Basin checkpoint and I’m not as cheerful as I might normally be which Dean detects straight away. I then speak to him with slurred speech, another sign of the next stages of dehydration. There and then I take the immediate decision to stay here for at least an hour. I get off all the sweaty kit and then lie on the blanket for 20 mins sleep. I’m offered an IV as it’s obvious what the problem is, but at this point I’m thinking let’s see how we are after a rest, whilst thinking how good it would be if this was the end. I thought hard about this. In the mixed up emotional state, and whilst not exactly feeling 100%, the drive to stop was gaining the upper hand. I have had a big running year, and there was no unfinished business on this course. I’ve also had a fairly stressful year and my mental preparation were far from ideal. I certainly wasn’t focussed on this event in the build up weeks, and my family don’t need to see me in hospital to know that I’m prepared to push through the pain barrier. I’ll save that for another day!! So I withdrew and without regret – and yet 3 days later I’m still wrestling the emotional and rational thoughts of “What if I had pushed on to the next CP?” The truth is I’ll never know, and the reality is that it doesn’t matter, I made the decision with the best information I had available to me at the time. I was still out there for 11 hours, and under different conditions things would have been very different. One thing is for sure I had again learnt more about myself, as I do from every event I enter, and I’ll share more of this in another post. After make the decision to withdraw I had the pleasure of seeing and helping out a few other runners coming through and sharing the experience through them. Guys like Roger who was in his first 100miler, who is diabetic and has a whole gamut of extra stuff to be thinking about when he is out there, and yet he cruised on through to the finish line. Inspiring stuff. The brutality of this race is without question, and even though I withdrew, I look at the results list and see that I am in some very good company. This race is known as the “Australia's Toughest Trail Race” for a very good reason. Bummer Andrew, sorry to hear about your dnf. Must say I am surprised your weight was down at Congewai given you had been drinking so much - 4.5ltrs to CP1!! That's a lot of fluid. You must either sweat heaps or pee often. Cheers Spud, live to fight another day. I'm a ridiculously heavy sweater, I'm sweating now writing this! I weighed myself later that night and was nearly 6kgs down, even with loads of food and fluids in between, so did the maths and reckon I'd sweated out about 15liters in the 11 hours I was out there. on ya' andy. live to come back and fight another day. the people I was with. d coombs and d rahmate both had to make hard decisions at the basin for various reasons and both also pulled out there. I also ran the hill out of the valley after CP2 to check out the course. if that was anything to go by, it is certainly a hard race. anyway good on you and no shame in being smart over stubborn with you condition. "If man has a talent and cannot use it, he has failed. If he has a talent and uses only half of it, he has partly failed. If he has a talent and learns somehow to use the whole of it, he has gloriously succeeded, and won a satisfaction and a triumph few men ever know." Cheers Jordan, that hill is a tough one, but not unique in this race. A touch call to pull out and feeling some regret now, so will be channeling these feelings for all future races. The challenge is to temper emotion with reason, which I guess is what I did at GNW. Thanks Mally, similar to yourself I'd say. Happy with what has been achieved this year, and now have heightened expectations for the future.